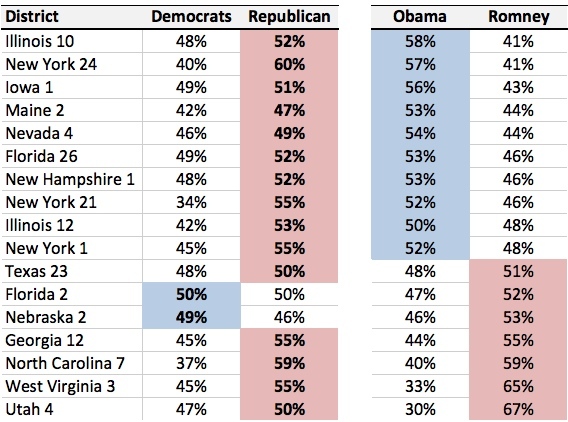 The following three tables compare the results in House, Senate, and Governors races with the presidential results in 2012. The first chart shows all 17 U.S. House districts that have flipped parties. Republicans gained four seats that Romney won but also made inroads by winning 11 seats that Obama carried. Republicans lost two seats–one centered on Omaha and the other on Tallahassee. In Nebraska’s Second District, the incumbent made the mistake of saying that he didn’t think he should have to give up his salary during the government shutdown. 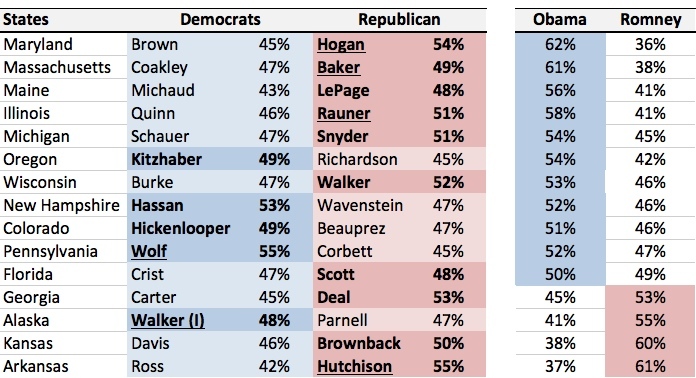 The next chart shows the results of key U.S. Senate races. I’m assuming that Landrieu loses the runoff in Louisiana since the two Republican candidates won 55% of the vote. 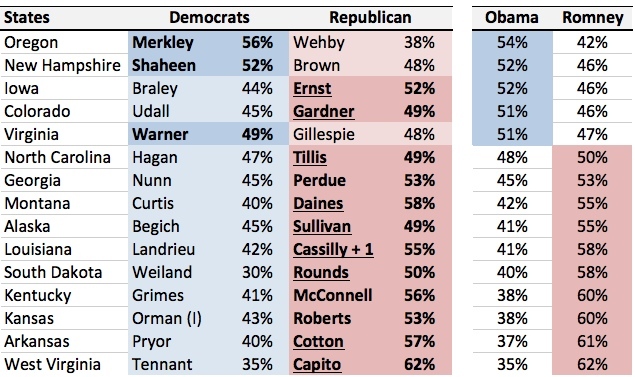 Additionally, I lumped Orman in Kansas with the Democrats. The GOP picked up nine Senate seats. Except for Colorado and Iowa, the winning party is the same as the state’s 2012 presidential winner. The final chart shows results in key gubernatorial elections. As you can see, Republicans made inroads in several other blue states. But Maryland is the bluest state that elected a Democratic governor and Hogan won by more than other Republicans who were reelected or picked up governor’s mansions in blue states.